Climbing Ranger, a photo by The Bacher Family on Flickr. Climbing rangers always look so rugged. It's not so much their wild hair and Gortex-heavy clothing, though most of them qualify in both regards, or even the extreme gear (helmets, carabiners, glacier boots) they wear as comfortably as you or I wear tennis shoes. 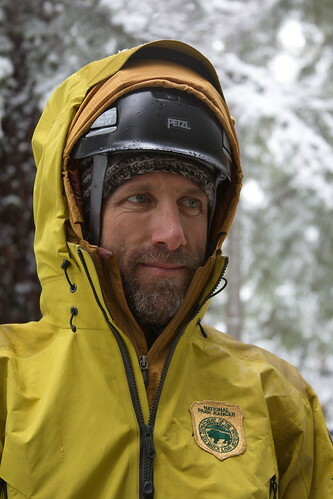 Mostly it's the look in their eyes: that attitude that a howling blizzard is a minor inconvenience, a 14,000 foot mountain a mere walk in the park, a deeply crevassed glacier on an active volcano the daily commute, and the rescue of an injured climber in the midst of all three merely a day's work.